Marking the upcoming International Mother Language Day, a twenty-day theatre festival titled ‘Ekushey Natya Utsab 2019’ started at Mukta Mancha of Suhrawardy Udyan in the capital on Saturday. Bangladesh Group Theatre Federation (BGTF), in association with Cultural Affairs Ministry and Bangladesh Shilpakala Academy (BSA), has arranged the fifth edition of the festival as a part of the ongoing Amar Ekushey Grantha Mela. BGTF chairman Liaquat Ali Lucky inaugurated the festival by releasing balloons in the presence of theatre personalities Ataur Rahman, Nasiruddin Yusuff Bachchu, Lucky Inam and BGTF secretary general Kamal Bayazid. 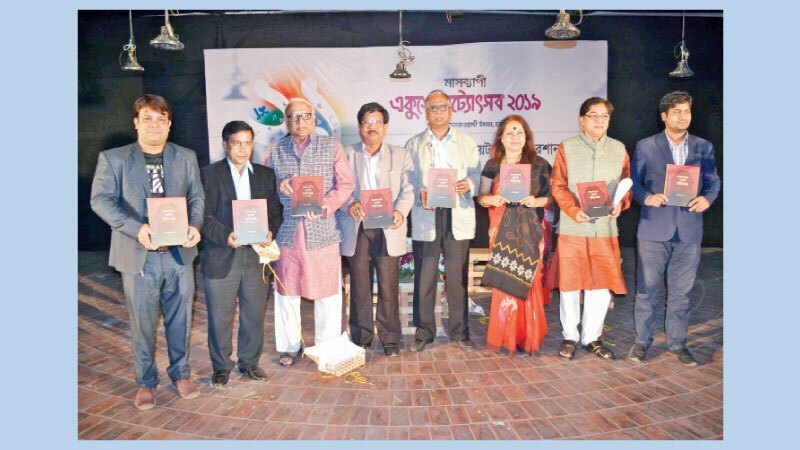 During the inauguration ceremony of the festival, the guests also unveiled the cover of a book titled ‘Bangladesh-er Shoto Borshi Natto Moncho’. Written by Liaquat Ali Lucky, BSA has published this book which is available at the stall (4-5) of BSA at the ongoing Boi Mela. Besides, a choreography by the artistes of different theatre troupes was performed at the opening ceremony. Later, theatre (Arambag) staged its romantic play ‘Nikhai’. Written and directed by Gazi Rakayet, the play explores one man’s romantic past with an unnamed woman and ends with a surprising reunion. Around 20 theatre troupes will stage their productions while some 20 more troupes will stage street plays during the festival at 4pm every day. To note, BGTF has been arranging the festival since 2015 as a part of the Amar Ekushey Book Fair.